We are very excited to kick off this new feature on Money View blog that will share real life stories of our Money View Personal Loans customers. Today we are showcasing Kalyan’s story who lives in Delhi and works as a Manager in a multinational company. Medical emergencies can take us by a suddenness that can be least anticipated. And the worse part of seeing a loved one suffer is the apprehension that they may not get the best medical attention due to lack of money. Many times the health insurance policy that we have may not adequately cover all medical needs. Kalyan faced a sudden medical emergency and was in urgent need of funds. That is when he thought of getting a personal loan. How did Kalyan come across Money View Loans? Kalyan ruled out regular institutions like banks because time was of the essence to him. So he turned to browsing on the net to look for legitimate, credible and fast personal loan options. That is when he came across several highly rated reviews of Money View Personal Loans. Curious, he went to the Play store and looked at the reviews of the App. At that time there were over 4000 reviews and almost all were positive. That reassured him that this was a legitimate company offering personal loans quickly and without collateral. What was the process of getting Personal Loans with Money View? Kalyan then went ahead and downloaded Money View Loans App. He followed the step-by-step instructions on the App and uploaded the documents as he was asked to do. The Money View Loans App showed the status of his loan clearly at all stages. Then he got a call from Money View team telling him that his loan was approved. And within 2-3 days of starting the process, the loan money was in his bank account. In Kalyan’s words, “It was a very smooth and hassle-free process”. Kalyan was extremely happy with not only getting a Personal Loan in time for the medical emergency but also because the entire process was really easy. Time: The entire process from application till disbursal of funds to his bank account took just 2-3 days. This is very important especially when one wants time-sensitive loans. Process: The procedure was straight forward, no hidden clauses, no cumbersome steps. He downloaded the App and just followed the steps as listed and he got the loan approved and disbursed in no time. Ease of getting Personal Loans: Whether it is a medical emergency or a luxury buy with Money View Loans getting Personal Loans is now really easy. Faster than Banks: Kalyan did not even try approaching a bank because he was aware how long and difficult the process of getting a loan from a bank is. 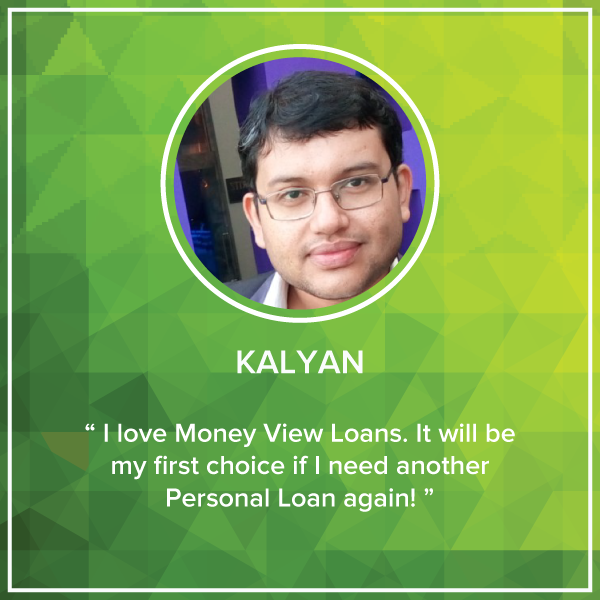 We are thrilled that Kalyan loves Money View Loans App and has already recommended it to his friends and family. Thank you so much for taking time and talking to us, Kalyan. If you have a Money View Loans story to share and would like to feature on the blog, do write in to blog@moneyview.in. Rachna Parmar is the Editor of this blog, Digital Marketer, Web-Columnist and popular blogger. She is also a fitness enthusiast, avid reader, home chef and mom to two brats and a Labrador. Mr. Kalyan’s review is very Impressive and happy to know about Mam Rachna Parmar, caz I too one among the family of Money View Loving users. Thanks and support to money view family…. this is a wonderful app …..I want to connect always time for this app…..Again thanks to support to me…..
Money view is the quickest way to get personal loan. I got loan in my imergency without any useless inquiry. I am really thankful to Money view. But Money view should minimize their loan charges if they want to make their app popular. Personal loan. I am very happy with moneyview. Story of kalyan is inspiring to get loan in critical condition. Flexible option for all your emergency needs… ???? Very nice one of the most important thing is the money view. Very very nice app and money view team. Only 16 hours my loan amount was reamburese in my account. That is wonderful, Lokesh. So happy that you got a swift loan with Money View. At What Salary Can I Apply for a Personal Loan?